Stir together the first five ingredients. Spoon chicken mixture evenly over tortillas and roll up. Arrange in a lightly greased 13 x 9 baking dish. Coat tortillas with vegetable cooking spray. Bake at 350 degrees for 35 to 40 minutes or until golden brown. Stir together sour cream and taco sauce in a bowl. Spoon sour cream mixture over hot enchiladas. Sprinkle with desired toppings: fresh cilantro; fresh chopped tomato, avocado, green onion. Instead of the small can of green chilies, I have been using a larger can of Rotel’s tomatoes and green chilies. 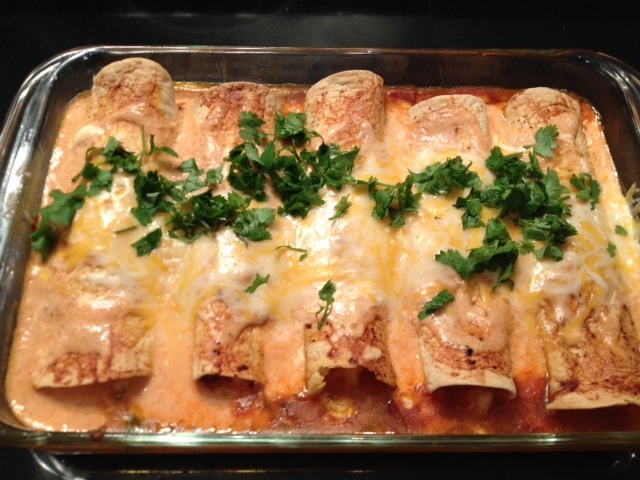 I like the addition of the tomato, which gives a pop of red inside the enchiladas and adds additional flavor.